to apply Anti-Seize to your bolts! 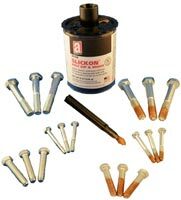 Click here to visit the catalog page for the SLICKON® BOLT DIP & BRUSH™. Click here to visit the catalog page for the AST-SEAL™ Std - Anaerobic Pipe Sealants. Click here to visit the catalog page for the AST-SEAL™ HD - Anaerobic Pipe Sealants.